Through thick, inked-smudged pages and oddly askew perspectives, Bayer tells the story of Chance Alphax, code named Zero Sum, who has time traveled a thousand years in the past to stop his fifteen-year-old self (who “only wants to date and listen to REO Speedwagon”) from eventual space travel to avoid a future predicated on “a thousand years with no love just isolation and insanity and the slow ticking of the clock...”. He enlists Mr. Incompleto to aid him in this while having to battle the other members of his supergroup, The Saturn Six, who are trying to stop him from creating a temporal rift which could DESTROY THE WORLD! Yea, it's typical cape and tights bombast and narrative wonk full of pronouncements and posturing, but this story line only serves as a framing device for Bayer's true intent. As the book sludges through the begrimed and chaotic pages that are characteristic of Bayer's art, the narrative switches focus from Zero Sum's quest to the awakening of young Chance Alphax to his potential. It becomes an unexpected bildungsroman in which a son must confront the father in order to become a man. The next hint comes on the second page of the book. The comic begins with Mr. Incompleto making pancakes for his horse-sidekick(? ), Hotspur, and Bayer takes the opportunity to tell his readers that “in one home, at least, the art of communication is still alive and well...” suggesting that in most households this is not the norm. Of course this domestic scene is interrupted, the breakfast trodden underfoot, trouble is brewing. Zero Sum's quest is to change his past. To change “one simple thing” to spare him a thousand years of suffering. Ideas of confinement and home and showing one's true face bubble up through the trope until Bayer makes his larger purpose clear at the end. It's commanding and impressive, but it requires an active reading, especially since Bayer throws curve after curve, through his art, through his beats, through playing with our expectations. As things on the surface seem to be go off the rails, his train of thought steadily chugs along the tracks, and once again Bayer proves that “even” superhero comics can be substantive in the hands of an artist. With Mr. Incompleto, Josh Bayer takes up the themes of isolation and identity he last explored in Theth and expands on them further. It's messy and confusing and stained and off-kilter, but it has to be, because it always is. 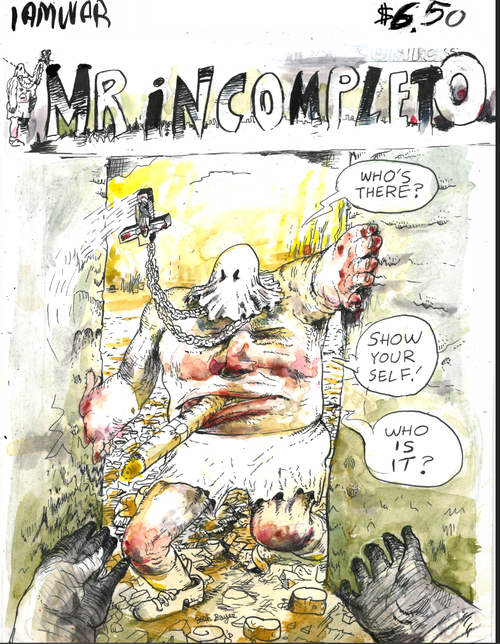 You can pick up a copy of Mr. Incompleto, along with a bevy of other Bayer books, at his website here.